After remaining relatively quiet on Delta’s bold moves into key markets from its Seattle hub, Alaska Air Group has opted to try competing elsewhere with Delta through the introduction of four new markets from Delta’s Salt Lake City in Jun-2014. The move by Alaska is interesting given it has served Salt Lake City for little more than a year after introducing service to Seattle in Apr-2013. While it takes varying timeframes for routes to reach a certain level of maturity, Alaska must be encouraged by the early returns on its performance in Salt Lake City, and feels comfortable expanding into markets where it has ample brand recognition, and in some cases, a solid position of strength. Even as Alaska’s decision to add service from Salt Lake City seems to be a response to Delta’s latest aggressive moves in Seattle, the expansion also reflects Alaska’s years-long strategy to diversify its route network outside the US Pacific Northwest into more transcontinental and mid-continental markets. Curiosity over how Alaska would navigate its relationship with Delta as the US major crafts a full assault on Alaska’s Seattle hub has been mounting. During the course of the last year in addition to expanding its presence in trans-Pacific markets (and to a lesser degree European routes), Delta has added or announced its intent to enter a significant portion of Alaska’s major markets from Seattle based on seats deployed – Las Vegas, Los Angeles, San Francisco, Portland, San Diego and Anchorage. Delta also plans to introduce service from Seattle to Vancouver (another market where Alaska is dominant) and Fairbanks, Alaska over the next year. A long-standing codeshare between Alaska and Delta is not being applied to Delta’s new market roll-outs from Seattle, as it appears Delta believes it can capture ample traffic under its own metal to feed its increasing number of international markets from Tacoma International airport. Perhaps accepting that Delta’s continuing pressure in Seattle is unavoidable, Alaska is proceeding with plans to diversify its network outside the Pacific northwest, and an expansion from Salt Lake City is fuelling that diversification during 2014. With the launch of four new markets from Salt Lake City during Jun-2014, Alaska will spool up to five markets from the airport in a just a little over a year after adding new service to its Seattle hub in Apr-2013. The new market additions will no doubt expand Alaska’s footprint in Salt Lake City, but the six daily roundtrip flights in Alaska’s new markets will do little to change Delta’s overall dominating 68% seat share at the airport. As of Dec-2013, Salt Lake City is Delta’s fifth largest US domestic hub in terms of peak day departures, at approximately 233. Given Delta’s stature at Salt Lake City it is not surprising that it serves every market Alaska is adding during 2014. Southwest also serves two of Alaska’s new markets – Portland and Los Angeles. Los Angeles is the most heavily served market Alaska is entering from Salt Lake City. 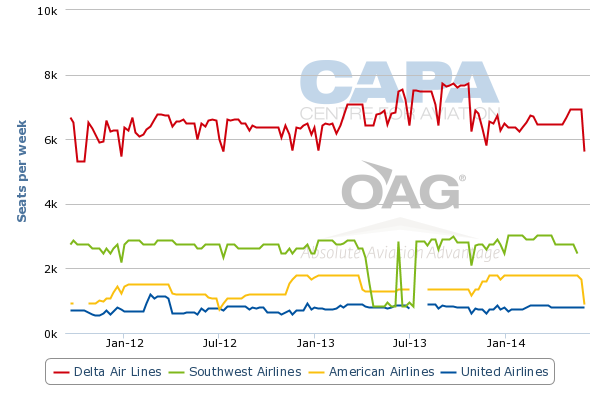 For the week of 15-Dec-2013 to 21-Dec-2013, four carriers are deploying roughly 12,000 one-way seats in the market. 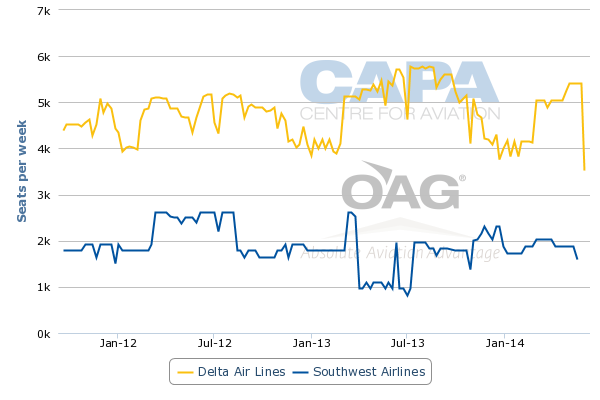 Delta holds a 55% share followed by Southwest at 24%, Alaska at 15% and United with a 7% share. 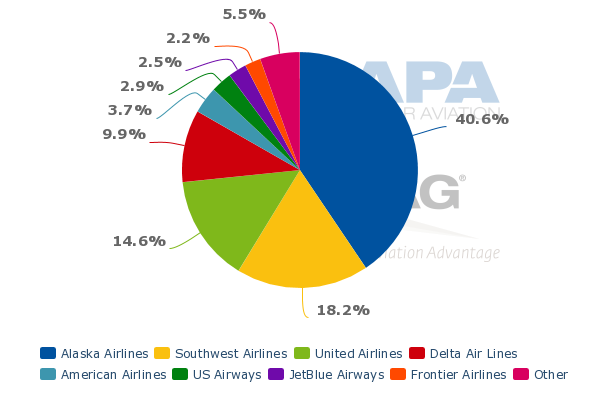 During the same week Delta and Southwest combined are deploying 6,600 weekly one-way seats between Salt Lake City and Portland, with Delta holding a 65% share and Southwest accounting for the remaining 35%. Alaska will introduce an interesting dynamic in those markets as a legacy and so-called low-fare carrier are already present in Portland and three legacy airlines and Southwest offer service to Los Angeles. Portland serves as a hub for Alaska, and is the carrier’s second largest base after its Seattle hub in terms of seats deployed. 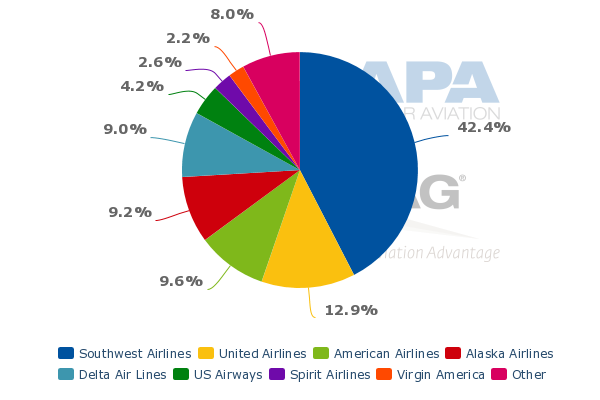 Alaska is the dominant carrier in Portland, holding a 41% seat share, so it has significant brand recognition in the market. Alaska is also offering a miles promotion on its new service from Salt Lake City, so initially it should have no problem tapping its base of passengers in Portland to fill its flights. Los Angeles appears a more challenging market from Salt Lake City as it is the airport’s third largest US domestic destination in terms of seat deployment behind Denver and Phoenix. 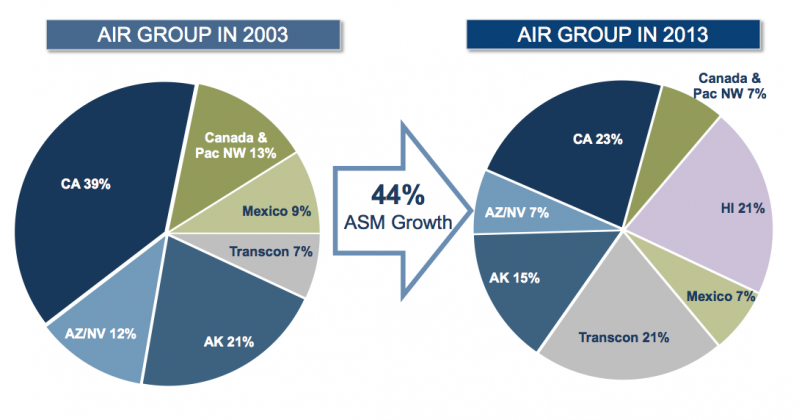 Los Angeles is such a fragmented market that no one carrier is dominant at the airport. However, Alaska serves numerous destinations from Los Angeles including Seattle, Portland, San Jose and Washington National in addition to transborder service to Vancouver, and Mexico City, Guadalajara, Puerto Vallarta, Loreto and Mazaltan. Smaller markets included in Alaska’s Los Angeles schedule are Santa Rosa, Medford and Mammoth Lakes. A single, daily roundtrip flight probably is not meant to maximise connections, but with its brand awareness in the US western region, and the ensuing promotional fares it will likely offer, Alaska stands some chance in at least annoying Delta by entering the Salt Lake City-Seattle market. Alaska plans to serve both Portland and San Diego with two round-trip flights from Salt Lake City, and San Jose and Los Angeles with a single daily flight. 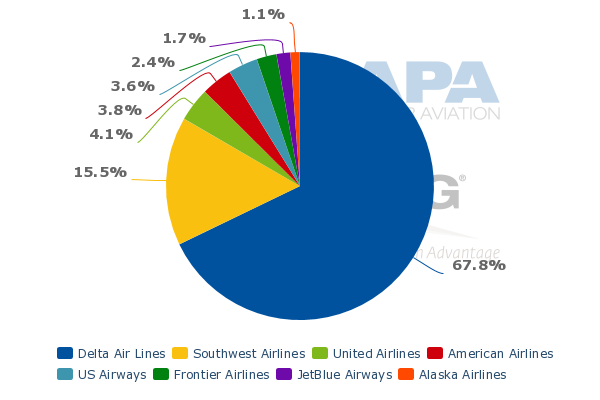 Although Alaska only accounts for roughly 9% of the seats on offer from San Diego, (roughly the same as Delta), it has been building out San Diego during the last couple of years through new transcontinental service additions to Boston and Orlando. Other markets Alaska currently serves from San Diego include Boise, Fresno, Honolulu, Kahului, Lihue, Los Cabos, Monterrey, Portland and Puerto Vallarta. The carrier could be aiming to connect passengers onwards to some of the leisure markets in Hawaii and Mexico. Current schedules in OAG show that Delta’s once weekly service from Salt Lake City to Puerto Vallarta and Los Cabos is ending the week of 9-Dec-2013 to 15-Dec-2013, while the only Hawaiian destination on offer from Salt Lake City is Honolulu, which is served by Delta. Through its mileage promotion and an ability to connect to leisure markets, Alaska could have a fair shot at competing with Delta on flights between Salt Lake City and San Diego, where Delta will offer approximately 4,450 one-way seats the week of 15-Dec-2015 to 21-Dec-2015. Delta is also the sole operator on flights from Salt Lake City to San Jose, offering about 2,100 seats for the week of 15-Dec-2015 to 21-Dec-2015. 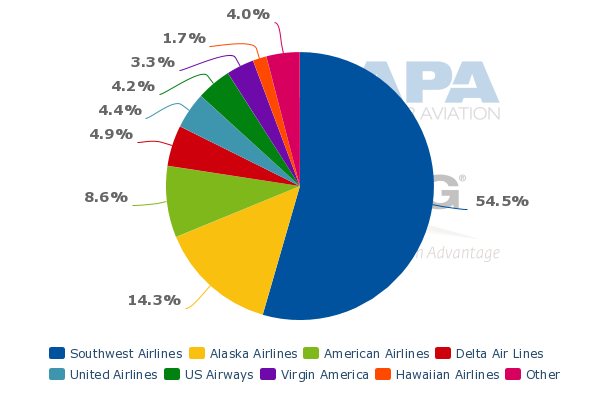 Alaska is the second largest operator in San Jose based on seat deployment, and offers flights to Boise, Guadalajara, Kahului, Kona, Lihue, Honolulu, Los Angeles, Los Cabos, Reno, Portland, and Seattle. But Alaska’s is likely aiming to capture local traffic with the new service to San Jose, which is the closest airport to the high-tech Silicon Valley corridor. Again, with some brand recognition already existing in San Jose, Alaska should not face huge challenges in stimulating traffic or perhaps initially capturing some of Delta’s passengers with lower fares. Alaska is no doubt getting a small jab at Delta with the new service to Salt Lake City, but overall the market falls into Alaska’s diversification strategy. Passenger counts at Salt Lake City fell 1.4% year-on-year during 2012 to about 20 million, and with Delta dominating at the airport, perhaps Alaska has some opportunity for stimulation in the market by offering lower fares. It has also selected markets where it believes it can quickly spool up given its market awareness in Portland, San Diego, San Jose and Los Angeles. Alaska’s bullishness in Salt Lake City is also reflected in its plans to add a third daily flight from Seattle during Jun-2013. Having largely concluded that service gaps to Hawaii have been filled after the demise of Aloha and ATA several years ago (indeed, the carrier has recently cited overcapacity in some of those markets), Alaska has opted to add different, longer-haul, US mainland flights to its network. 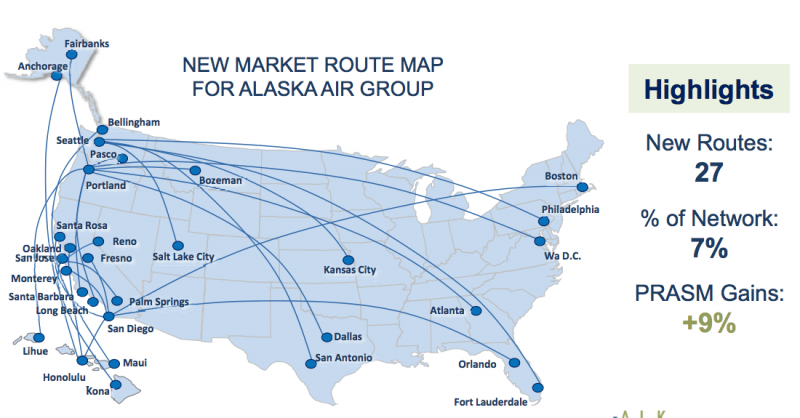 Of the 27 new routes Alaska has introduced during the last 24 months, several have been mid-con and trans-con routes including Salt Lake City, Kansas City, Dallas, San Antonio, Atlanta, Orlando, Fort Lauderdale, Boston, Philadelphia and Washington, DC. Expansion from a mid-con market like Salt Lake City on the whole seems a like a low-risk gamble in fleshing out its network, and a natural progression as it looks to grow eastward from the mounting pressure from Delta in its north-south markets from Seattle. Transcontinental routes represent about 21% of Alaska’s capacity in 2013 compared with 7% in 2003. Delta is unlikely to feel threatened by Alaska’s new round of encroachment in Salt Lake City, but it will no doubt be watching with great interest to see how its would-be codeshare ally is spreading its wings. The launch of Delta’s new joint venture with Virgin Atlantic just weeks away and given its significant focus on Seattle and Salt Lake City’s standing in Delta’s domestic hub structure, Delta could possibly ignore Alaska’s expansion from Salt Lake City. But that is highly unlikely as Delta during the last couple of years has assumed a take-no-prisoners attitude in terms of fleshing out its network. The carrier is no doubt readying to flex its muscle to defend its Salt Lake City hub, no matter how small the threat from Alaska.